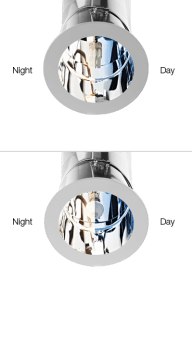 The Solatube 160 ISn delivers daylight to spaces up to 200 sq. ft, such as bathrooms, laundry rooms, closets and hallways, or in multiples for larger rooms. Includes an integrated Solar Electric NightLight for a soft glow at night and qualifies for a 30% federal tax credit. With a thermal insulation panel, the Solatube 160 DSe is designed to minimize heat loss in extremely cold climates and heat gain in extremely warm climates. As a result, it’s earned an Energy Star rating. The Solatube 290 ISn delivers brilliant illumination to spaces up to 300 sq. ft, such as the kitchen, family room, master bath, and large entryway. Includes an integrated Solar Electric NightLight for a soft glow at night and qualifies for a 30% federal tax credit. The Solatube 290 DSe, which features a thermal insulation panel to minimize heat loss in extremely cold climates and heat gain in extremely warm climates, has earned an Energy Star rating. This kit works with compact fluorescent bulbs only and complies with California Title 24 requirements. For the 160 DS, the light fixture houses one 26-watt compact fluorescent bulb. For the 290 DS, up to two fixtures may be installed. This kit works with either compact fluorescent or incandescent bulbs. For the 160 DS, the light fixture holds one 23-watt maximum compact fluorescent bulb or a 100-watt maximum medium base incandescent bulb. The 290 DS light fixture holds two bulbs. Bright sunlight flooding your home is great...unless you want to take an afternoon nap or use your entertainment center in the middle of the day. Never fear. The optional Daylight Dimmer solves this issue. Using a patented butterfly baffle and a convenient wall-mounted switch (sold separately), the Daylight Dimmer lets you adjust room light levels simply and easily. Adding daylight to your home is easy!